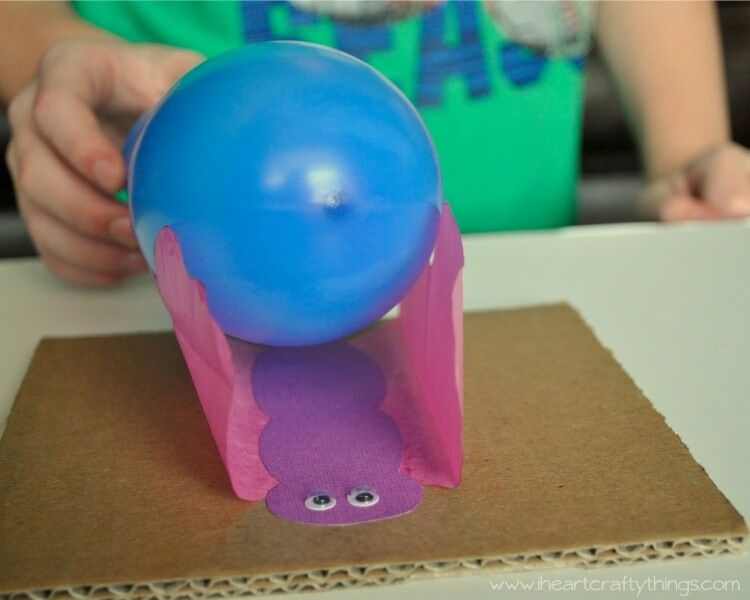 Static Electricity is a fascinating subject, especially for preschoolers. Every once in a while someone in my household will touch another family member after unintentionally rubbing their feet on the carpet and will give them an accidental shock. It stirs up all sorts of fun conversations about electricity. 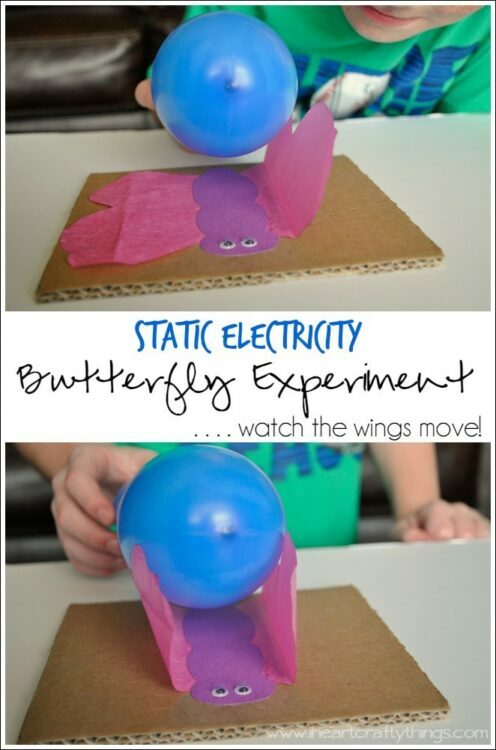 My Mom used to be a school teacher and I remember her using this fun static electricity experiment where children charged a balloon and could magically make butterfly wings flutter up and down. I decided to give it a go with my children and it was oodles of fun! Usually, an atom has an equal number of protons and electrons. Electrons have a negative charge of electricity and protons have a positive charge of electricity. Opposite charges attract, so when materials rub together and one material becomes negatively charged and one is positively charged, static electricity results. To demonstrate the effects of static electricity. 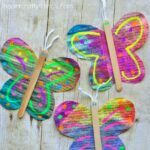 What will happen if we charge a balloon by rubbing it in our hair, and then hold it over tissue paper wings of a butterfly? 1. Start by cutting a square of cardboard. I made mine about 7 inches x 7 inches. 2. 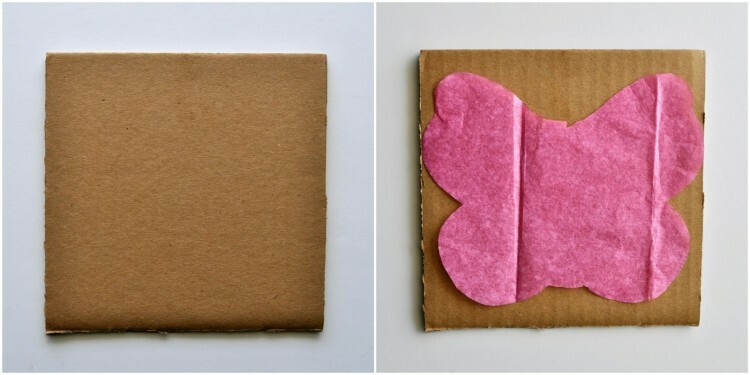 Use your pencil to draw butterfly wings on your tissue paper. Since my cardboard square was 7″ x 7″, I just made sure to make them smaller than my square. Cut them out and set them onto your cardboard. DO NOT glue them onto the cardboard! 3. 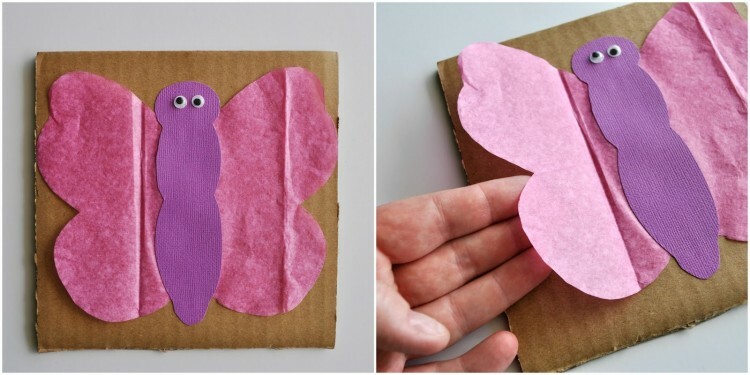 Cut a butterfly body out of your cardstock paper and glue it down the middle of your butterfly and overlapping it onto your cardboard. Again, DO NOT glue the tissue paper wings down. You will want the wings loose like shown in my picture below. 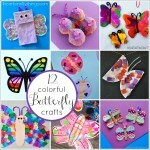 Glue your googly eyes down onto your butterfly. I should have drawn antennae on our butterfly but I just didn’t think about it at the time. You can add those if you choose. 4. Now comes the fun part. Blow up your balloon. We used water balloons that we had leftover from this summer so they were small in size, but using regular sized balloons would have been even better. 5. Rub your balloon in your hair to give it an electric charge. 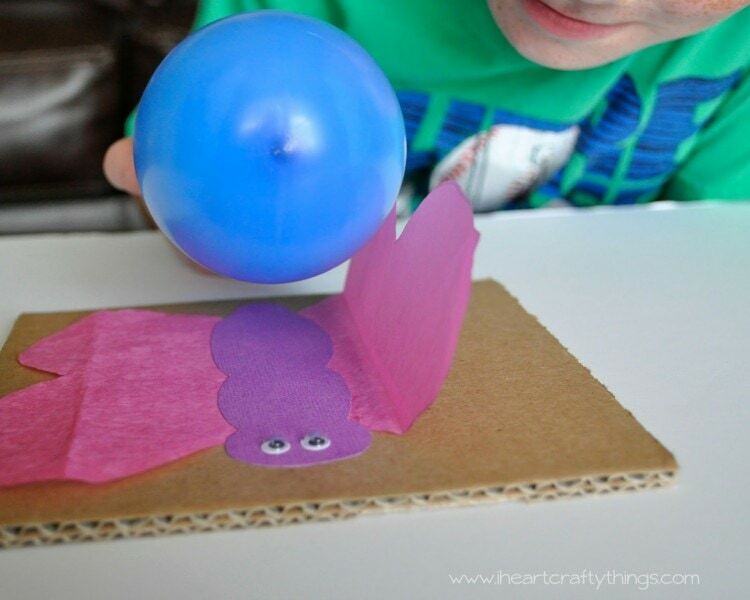 Now hold the balloon on top of your butterfly, close but not touching it, and watch the wings raise and lower as you move the balloon closer and farther away. My preschooler loved this! If the charge starts to fade, simply rub the balloon in your hair again and it’s ready to make your wings flutter all over again. It was a little difficult to get great pictures of the butterfly in action because my daughter moved so quickly. Results: Why did the butterfly wings move? When we rubbed the balloon onto our hair, electrons were lost from our hair and gained by the balloon giving it a static charge. When the negatively charged balloon gets close to the positively charged tissue paper they are attracted to each other, and the pull of attraction is so great that the lightweight tissue paper moves toward the balloon. This experiment is obviously not limited to only preschoolers. My 9 year old son had a great time experimenting with the balloon and butterfly. He was a little more controlled in his movements so I was able to get a couple better pictures. 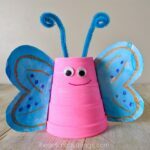 This post is part of a collaborative Creative Preschool series where 4 bloggers and myself have joined together to bring you fun crafts and activities based on a common preschool learning theme. This week we are sharing ideas focused on Science Experiments. 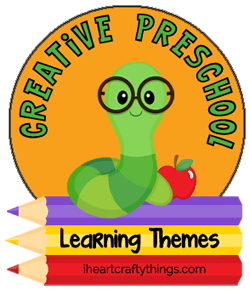 Stop by Friday, November 7th for Fall Preschool Posts. 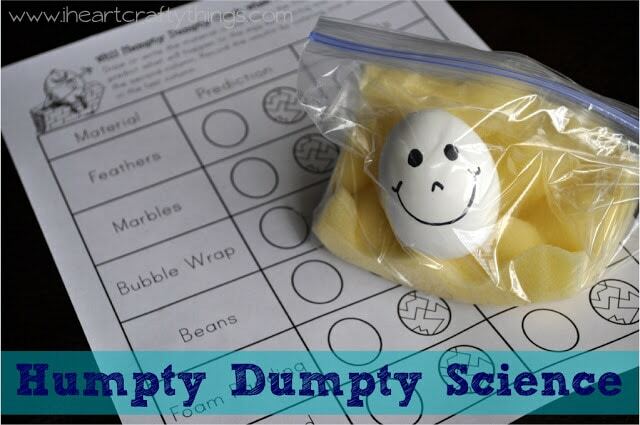 You might also like our Humpty Dumpty Science Activity! I hope that you are enjoying this beautiful fall weather. I don't know about you but I am not quiet ready for the snow and winter to come. Take Care! Great way to inspire a love of science in your kids! And I love that the butterfly looks like it is hugging the balloon 🙂 Thanks for sharing @ Saturday Science. I've got this post pinned and scheduled to share on Facebook and Twitter! This doesn’t work. It’s a really good experiment, but for me, it doesn’t work. 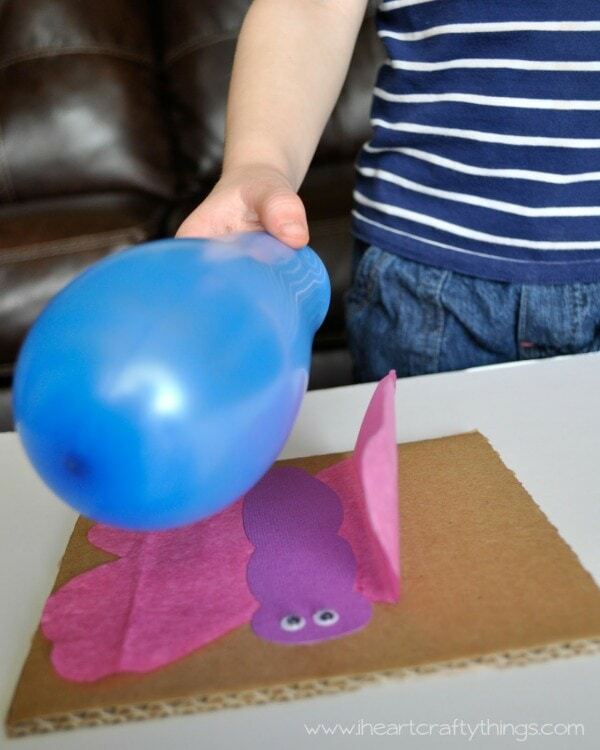 I blew up the ballooon and hovered it over the butterfly, but it does not pull electrons. Hi Linh. After you blow up the balloon you have to rub the balloon on your clothing or your hair to charge it. If you skip this step it will not pull electrons. Hope this is helpful.